Cuban banks are few and far between. In 1993, when the fall of the Soviet Union forced Cuba to open up tourism and foreign investment, the US dollar was legal in Cuba alongside the peso. 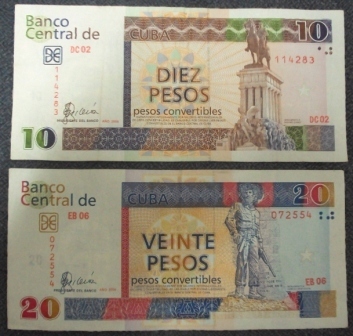 Now US dollars in Cuba are not legal currency so they must be changed to CUCs (pictured below). Under the embargo it is illegal for Cuba to use US dollars or for anyone anywhere to do business with the country in US currency. Keep an eye on the daily news reports about new Cuba-US relations because there is no doubt that the restrictions in place on currency may change. American Express is reviewing the new regulations regarding use of American credit cards in Cuba. They hope to soon allow customers this choice. MasterCard and Visa are both accepted. You can use the Visa card in the few ATM bank machines. If one machine rejects your card, don't worry, try the one next to it. There is never an explanation about why some work and others do not. Contact your bank before traveling to make sure that your card will be accepted in Cuba. You can also find ATMs outside of minor bank branches. Remember that at the moment you can only use your Credit Card--not associated with a US bank--in these machines, for cash advances. 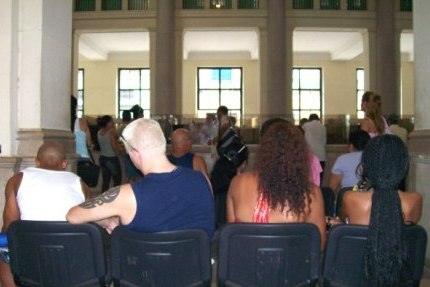 As mentioned above, the banking rules may change any day so check the latest news on Cuba regulations before leaving for the island. UK residents can make debit card withdrawals as long as their bank has no association with a US bank. Money Orders can be cashed in Havana--depending--but it's probably not worth the aggravation. If you lose them, they cannot be replaced in Cuba.